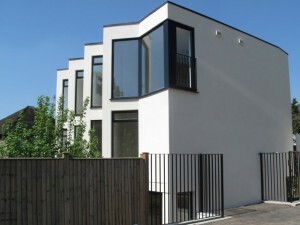 Dunedin Mews by LEATHWAITE is a low carbon development comprising 3 x Two Bedroom Apartments. 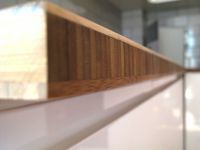 The modern exterior design is reflected in the advance construction method and technologies employed throughout the build to create leading edge urban homes. 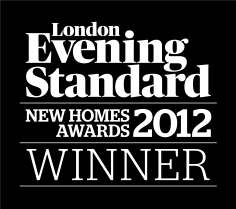 At the prestigious London Evening Standard New Homes Awards the Dunedin Mews project received the award for ‘Best Small Development’. The previously brownfield site has been transformed with a new development including a Penthouse and two Duplex Apartments each with their own private entrance and allocated parking space. These leading edge urban homes are surrounded by a landscaped amenity space with an attractive pedestrian entrance. 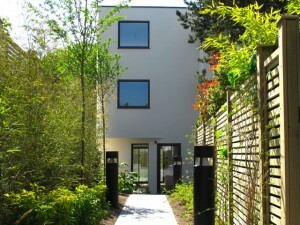 In addition to the communal outside space the two Duplex Apartments both benefit from their own private outdoor space. The development has been certified as achieving Level 3 of the Code for Sustainable Homes by Stroma, ‘Secured by Design’ from the Metropolitan Police and featured in ‘Professional Builder’ Magazine. As a classic urban ‘backfill’ site a creative and unique architectural solution was required to meet the challenges of sensitivity to the close site surroundings, whilst maximising the use of space and light and integrating the sustainable elements such as a green roof. The result is a truly unique building and a bold architectural statement, of a quality not normally associated with this scale of development. The building structure is built using a ‘Modern Method of Construction’ known as Insulating Concrete Formwork (ICF). The ICF building system is based on large, hollow, lightweight polystyrene forms that interlock together without glue or mortar to provide a formwork system into which concrete is poured. 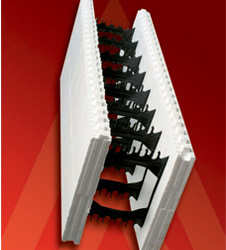 Once set, the concrete becomes a high strength, air-tight structure. The polystyrene remains in place as insulation, and is finished externally with a high-tech render system. Reduced CO2 emissions for the building, achieving one of the mandatory elements of Code Level 3 – a minimum 25% improvement over Building Regulations Part L.
An Air Permeability test returned results of an average of 3.79 m3/(h*m2) compared to Part L requirement of 10 m3/(h*m2). Airborne and impact sound insulation tests results, which were at least 8dB better than Part E minimum standards. The Insulating Concrete Formwork system used has been awarded an A+ by the BRE under its Green Guide to Specification assessment scheme. The system also produces minimal waste during construction as the waste materials can either be recycled or re-used. The original brownfield site, which was dominated by hard standing with residential garages, had a low ecological value. The new development includes landscaped grounds and a Bauder Extensive Green ‘Living’ Roof which contributed to a ‘major enhancement’ in the ecological value of the site as independently assessed by an Ecologist. As the brownfield site was all hard-standing the addition of landscaped grounds and a green roof has reduced the surface water run-off by more than 50%; a positive impact on the local environment. The local Metropolitan Police Crime Prevention Design Officer was involved from the design stage to integrate security advice into the development plans. This included boundary treatments, entrance design, external lighting, specification of windows and doors, design of amenity space and cycle storage. Due to the high performance of the building envelope, and in particular air tightness the building does not have a conventional gas boiler and central heating system. Instead each apartment has a dedicated Nilan VP 18 active heat recovery unit for extracting hot, humid air from kitchens, bathrooms and cloakrooms. Dust particles, moisture and smells are thus removed from the dwelling, ensuring a comfortable indoor climate. The energy recovered from the extracted air is used to provide domestic hot water and to heat the incoming air. The VP 18 also has a cooling system, allowing the unit to cool the incoming air. The energy contained in the incoming air is utilised for water heating before the cooled air is used to ventilate the dwelling. “Free” air cooling is therefore provided whenever the water requires heating. Working with industry leading construction waste recycler ProWaste enabled 96% of all waste during the build to be recycled. The new amenity space includes a bin and recycle waste store.ransformed the previously brownfield site. The new pedestrian entrance and landscaped amenity space creates a pleasant surrounding for the accommodation. The Electricity supplier for Dunedin Mews is Good Energy who is the UK’s only dedicated 100% renewable electricity supplier. While all other electricity suppliers rely on electricity generated using fossil fuels and nuclear power, Good Energy remains the only one whose electricity fuel mix is 100% renewable – from wind, small hydro, solar and sustainable biomass. For more information about Good Energy click here. 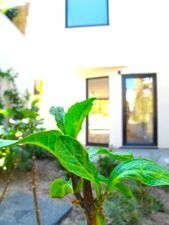 The Dunedin Mews development has been independently assessed after completion by Stroma and certified as achieving Level 3 of the Code for Sustainable Homes.